I urgently appeal to all men and women of good will, and all those near or far, including the highest levels of civil institutions, who witness the scourge of contemporary slavery, not to become accomplices to this evil, not to turn away from the sufferings of our brothers and sisters, our fellow human beings, who are deprived of their freedom and dignity. Instead, may we have the courage to touch the suffering flesh of Christ, revealed in the faces of those countless persons whom he calls “the least of these my brethren” (Mt 25:40, 45). 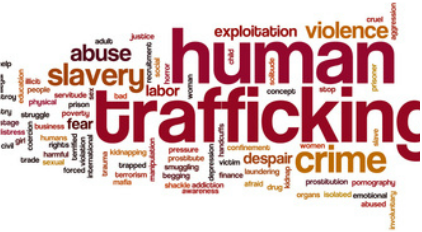 Human trafficking is the illegal trade of human beings for the purposes of forced labor, sexual exploitation and even the sale of organs. And it’s lucrative, annually generating $32 billion a year worldwide. That’s why it’s one of the fastest growing criminal industries in the world, exceeded only by the illegal arms industry and second only to the drug trade. Viewed through the lens of Catholic social teaching, human trafficking is a crime against the most basic aspects of human dignity and human rights. It preys on the poor and vulnerable and exploits their labor. Under threat and often in isolated conditions, trafficked people have no community support, no recourse, no voice. Largely hidden from view, the scope of human trafficking has long gone unnoticed by the developed world, which often benefits from the cheap labor and economic, though illicit, gain. But that is changing. "Stolen Lives: A Gospel Response to Human Trafficking"